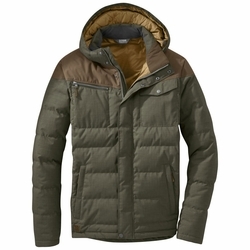 Outdoor Research Whitefish Down Jacket. In the deepest months of winter, the average daily high temperature in Whitefish, Montana, hovers just below 29 degrees Fahrenheit. Rugged and designed in a classic western work wear style, the down insulated Whitefish Down Jacket is the ultimate around-town jacket for those days.